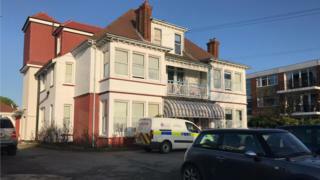 A man has denied the murder of his elderly mother who fell from a balcony at her care home. June Knight, 79, was discovered outside Langley Lodge Nursing Home in Westcliff-on-Sea, Essex, at about 22:00 GMT on 10 December. Robert Knight, 52, of The Fairway, Leigh-on-Sea, has denied murdering her during an appearance at Basildon Crown Court. He is due to return to the court on 8 May for his trial.